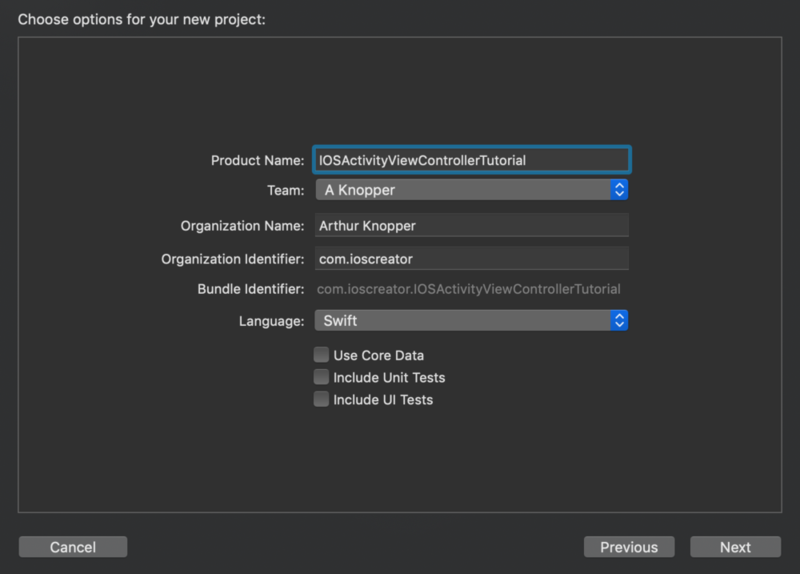 For product name, use IOSActivityViewControllerTutorial and then fill out the Organization Name and Organization Identifier with your customary values. Enter Swift as Language and choose Next. For this tutorial an image is needed. Download the image. Open the Assets folder and drag the downloaded image to it. Drag an Image View to the main view. Select the image View and go to the Attribute Inspector. In The Image View section select the image name in the Image field. A system action button is assigned to the navigation bar. When clicked the shareImage method will be called. Implement this method. An Activity View Controlller is created and presented with the image view as an acitvity item. The image will be saved to the Photo Library so the user must be granted the permission to access the Photo Library. Open the Info.plist and add a new row. Select "Privacy - Photo Library Additions Usage Description" and fill in a custom text in the adjacent String filed. Build and Run the project. Select the Action button in the Navigation bar to display the Activitiy View. Select "Save Image" and Choose OK to grant the application access to the Photo Library. The photo will be added to the Photo Library. 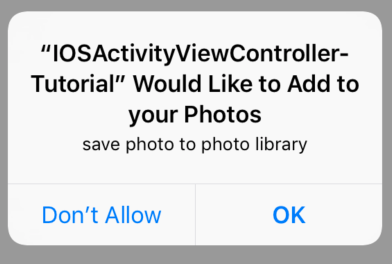 You can download the source code of the IOSActivityViewControllerTutorial at the ioscreator repository on Github.